Check out a complete selection of our cameras, including detailed descriptions of all important functions. What will you find when you open the box? See our cameras high-quality recordings for yourself. Professional camera for true connoisseurs. The latest model is an improvement on the existing TrueCam A5s camera. The basic kit includes a GPS module with speed camera detection and an option to have great voice guidance on your ride. The video resolution has been improved up to 2560×1080 (21:9) and 2304×1296 (16:9) at a rate of 30fps. Due to the high quality of the recording it is able to recognise faces or identify license plates even easier. The camera handles itself superbly no matter the situation. No matter whether it is at night, in poor visibility when driving towards bright lights or under other difficult circumstances the footage will still be captured at the highest quality and with maximum sharpness. Easy installation and operation of the mount, including a power supply. To install the camera easily every day, you simply “snap” and go. Front view of the TrueCam A7s. The intelligent mounting bracket, LED illumination and high-quality lens with interchangeable CPL and UV filters. Side view of the TrueCam A7s dashcam with memory card slot and output for connection to a HDTV or computer. Easy installation thanks to the camera mount, into which the power connects. Quick everyday installation – just “snap” and go. The controls of the TrueCam A7s are intuitive, fast and in English. The most important functions are simply activated at the push of a button whilst recording. 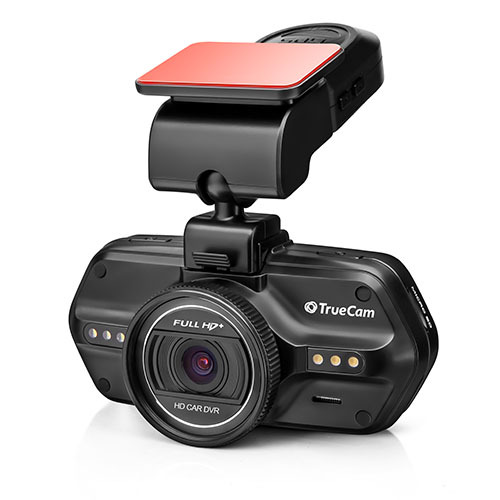 The TrueCam A7s car camera is the ideal partner for your journey. Now with breakthrough speed camera detection and voice guidance. The camera shoots at a high resolution of 2560×1080 (16:9) or up to superwide resolution of 2304×1296 (21:9). The camera captures high-quality images even in adverse conditions. Whether it is bright, gloomy, dark or night-time, your shots will always be perfectly sharp and clear. Thanks to this, it recognises even the tiniest of details, such as the human face or vehicle license plates. A new function of the TrueCam A7s camera is the SPEEDOMETER function. With it you can monitor your current speed and direction (shown as a compass) directly on the display. As well as displaying the compass and current speed, the camera will also alert you to upcoming speed cameras. The display shows the speed limit while approaching the speed camera, its distance and will alert you when speeding. The SPEEDOMETER function can be set as a screensaver so that the display does not distract, for example, when driving at night. The TrueCam A7s is equipped with a GPS module which provides many features, giving you even more details about your driving. Thanks to the GPS it is possible to map the route and speed. Under the camera settings you can choose whether to display the speed within the video or in the software application where you can view the acquired data and route on Google Maps. 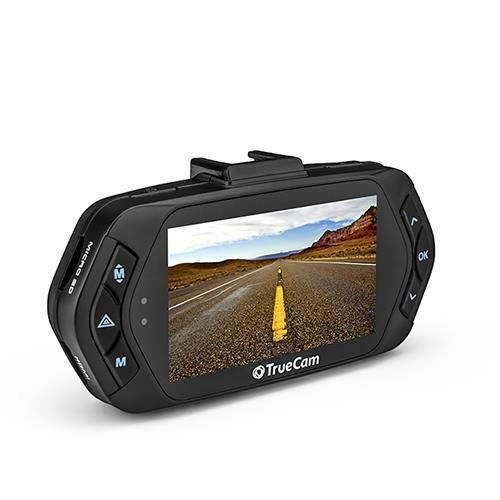 The TrueCam A7s camera can alert the driver to fixed speed cameras, average speed cameras, red light cameras and other places where it is good to exercise caution. Our database contains more than 33,000 locations in 36 European countries and Russia. Using voice guidance, the driver is warned of dangers or against speeding. The database is extremely accurate and offers free updates. Quick and easy handling and preparation for the journey ahead is a must for a camera that is used every day. The installation of the TrueCam A7s takes a matter of seconds. The camera holder is permanently mounted in the car, including the power connection, and the camera can just be snapped into the holder and you are ready to go. 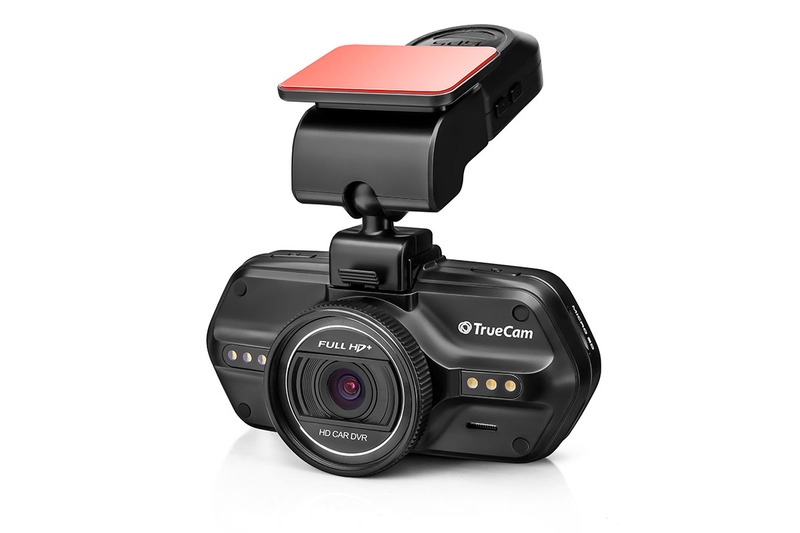 The loop recording function of the TrueCam A7s car camera allows you to continuously record. Once the memory is full, the camera will automatically record over the oldest files and replace them with new ones. There is no need to interrupt the recording or manually capture the new material, everything is automated. If you have any important recordings or photos that you want to keep, you can easily lock them and protect them from being deleted. You can lock the video whilst recording. The G-sensor records the direction of your journey in three-dimensional space. This data can be analysed and displayed using the application software. This sensor also enables the dash cam to detect when an incident takes place and lock it to prevent it from deletion whilst loop recording. It can be seen on the chart later exactly from which direction the impact occurred. 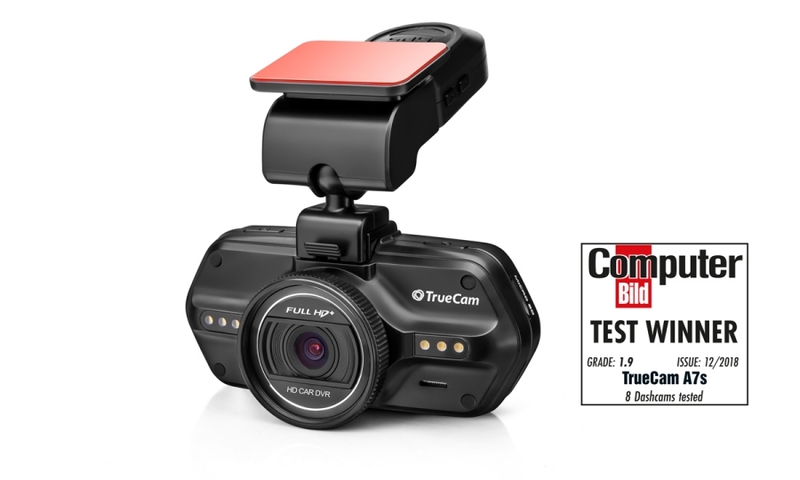 The TrueCam A7s includes safety systems designed to minimise traffic accidents. This makes travelling safer for drivers as well as for other road users. LDWS (Lane Departure Warning System) is a mechanism for warning the driver when the vehicle begins to move out of its lane. On top of this FCWS (Forward Collision Warning System) warns the driver when not keeping a safe distance from the vehicle in front. At the lights the system even alerts you when the car in front pulls away. This feature is ideal for long distances when drivers often lose focus. Everything is set up so that the system aids you without being intrusive. Note: This function is currently in the development stage (beta) and it is necessary to download the latest firmware version marked with the letter “L“. To avoid erasing important material due to overwriting during loop recording, these recordings can be locked. This can be done using a special key whilst recording or viewing a recording. This material is then archived and protected against deletion. If you later decide that you would like it removed, just unlock the recording and it can be deleted in the normal way. 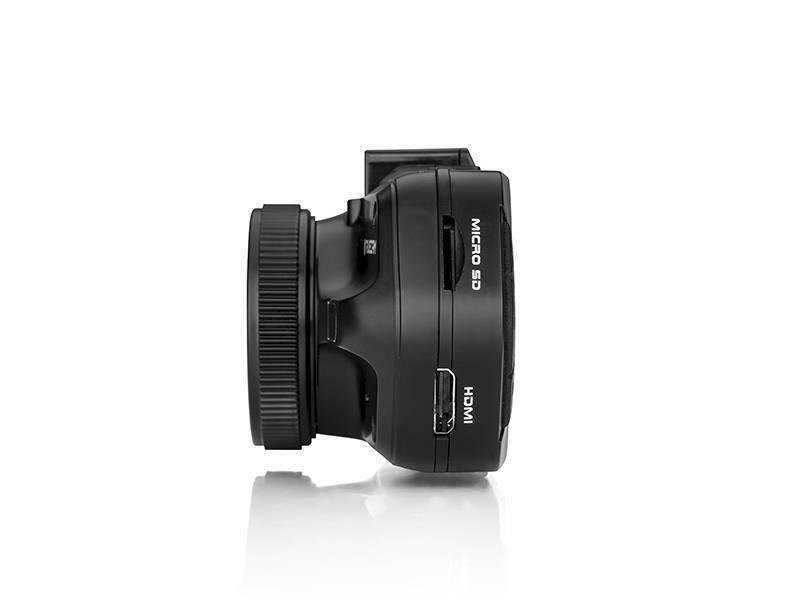 A clear 2.7″ LCD display makes it easy to control the TrueCam A7s. It does not matter whether you are shooting a video or just browsing through the recordings, the screen with provide you with a complete overview. The camera menu is completely in the English language and has a simple, intuitive interface. The TrueCam dashboard camera guards your car in your absence. Thanks to motion detection, the camera starts recording any time motion is detected. If someone crashes into you or damages your car, you have everything on record at the highest quality. This clear evidence can then be passed onto the police, including the license plate or the face of the offender. Along with the TrueCam A7s car camera, it is possible to buy special replaceable filters, namely a CLP polarizing filter and a UV filter. These filters protect your lens and provide an even higher image quality. The polarizing CPL filter ensures the removal of any unpleasant reflections, glare and obtrusive elements from the windscreen of the car. The UV filter provides greater vibrancy and saturation, making the whole image look natural. These filters are not included in the basic package! 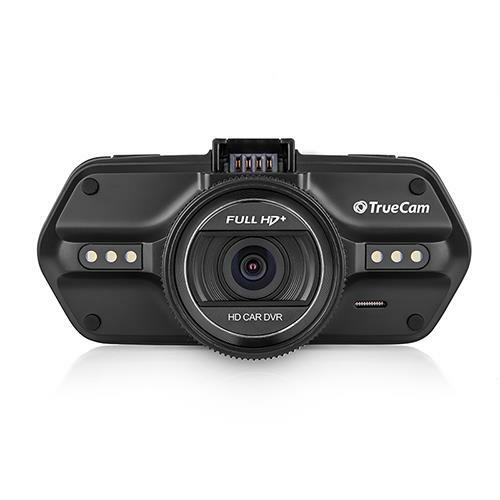 Shooting in low light conditions, at dusk or at night is no problem at all for the TrueCam car camera. The outstanding lens and aperture ensures clear, high-quality images, even at night. With limitless potential you can be confident that this in-car camera will always take great shots. The HDR (wide dynamic range) function ensures that your camera copes with difficult contrast shots. Typical examples of such are the contrast between light and shadows or between the road at night and the lights of oncoming traffic. HDR ensures a quality picture even under these circumstances. If the display distracts you or is too bright, you can simply disable it at the touch of a button and it can be turned on again in the same way. It is also possible to set up an automatic shutdown where after a selected amount of time has elapsed the display will go into sleep mode. The camera has a high-quality microphone but if you suddenly receive a phone call and do not want the camera to record the audio you can mute the recording immediately by pressing a button. Pressing the button again will reactivate the audio recording. The car camera has a dedicated button for taking photos. If you need to take a photo whilst recording, there are no complicated settings to adjust, you simply press the shot button. The TrueCam A7s software also enables you to take a photo of previously recorded video by pressing the button. 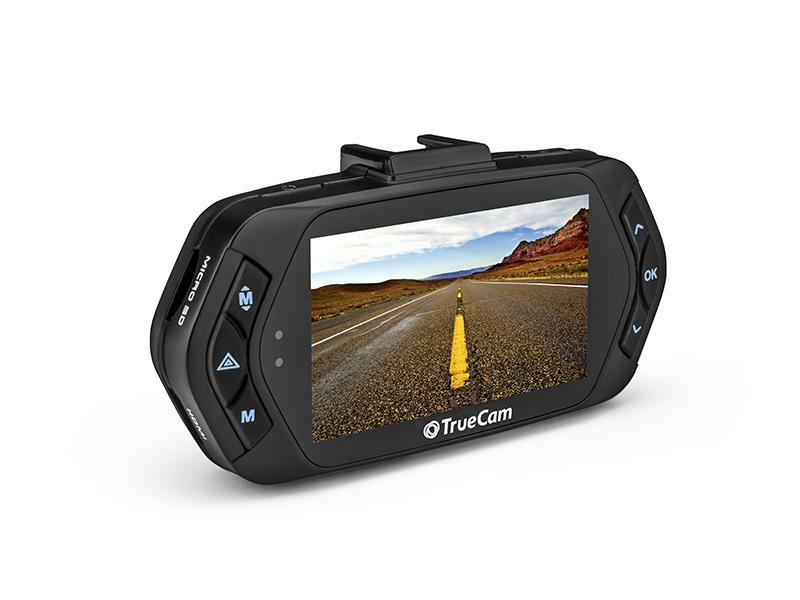 The TrueCam A7s in-car camera offers a wide range of luminance, thanks to which you can precisely choose the most comfortable level. Before recording you can monitor it on the LCD screen to see which level suits you best. This feature is especially useful for those whose car is used by multiple persons or owners of corporate vehicles. The name of the driver who is using the car can be entered into the camera to avoid unwanted confusion, so that if needed, the driver can be easily identified. When enabled, the driver’s name appears on the recording. 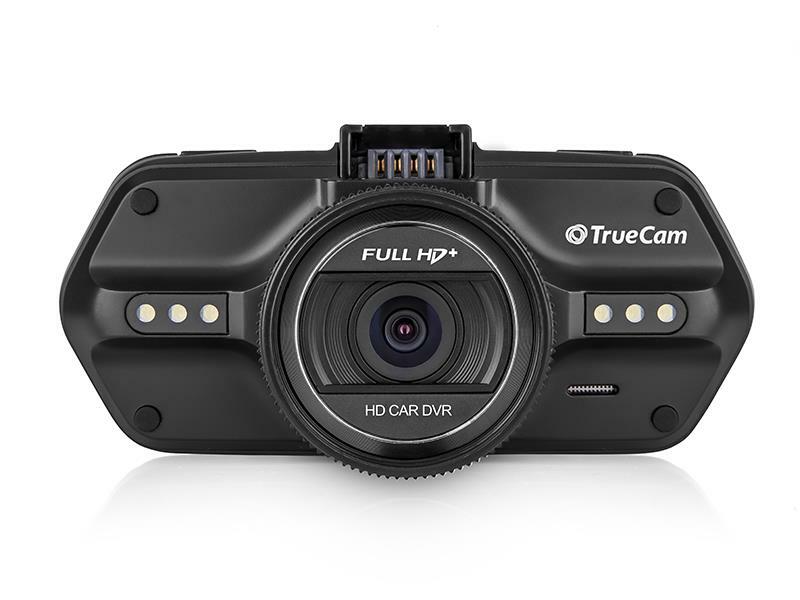 The TrueCam A7s dashcam requires no adjustment, it adjusts to you. Set it up as you need in your car so that it does not get in the way. The camera can easily record upside down by choosing the 180° rotation mode in the menu and then the image and all other display information will be shown in the classic way. The TrueCam A7s camera features LED illumination. These lights illuminate in low light conditions. For example, if you need to document an accident at night, simply remove the camera from the windscreen, and thanks to the LED lighting you can obtain the necessary evidence, regardless of the time of day or environment. Comfort is guaranteed when using the camera at night, due to the backlit buttons. The backlit keys are perfectly visible even in the dark and you do not need any external source of light to control the camera. If this function is not needed, it is, of course, possible to turn off the backlight at any time. If you want a truly authentic recording with a variety of useful information, it is possible to display the current speed on the recording. This function can be deactivated at any time and the speed record can be stored to view privately using the software application. A further feature of the TrueCam A7s is the ability to view your location on the video, thanks to the GPS module. If you do not want this information on your recording, the function can be easily turned off so that the location information on the recording can be kept to view privately using the software application. The TrueCam A7s has a user-friendly interface integrated with the Google Maps application, where you can get an overview of the route of your journey. In the case of more frequent trips over a longer distance you can get a good idea of your speed and distance and can analyse the results to improve your journey in the future. This feature is especially useful for sports and professional drivers. 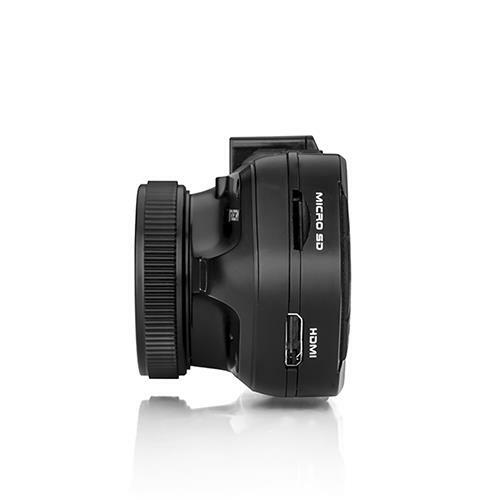 The modern TrueCam A7s camera offers you smart and useful software. 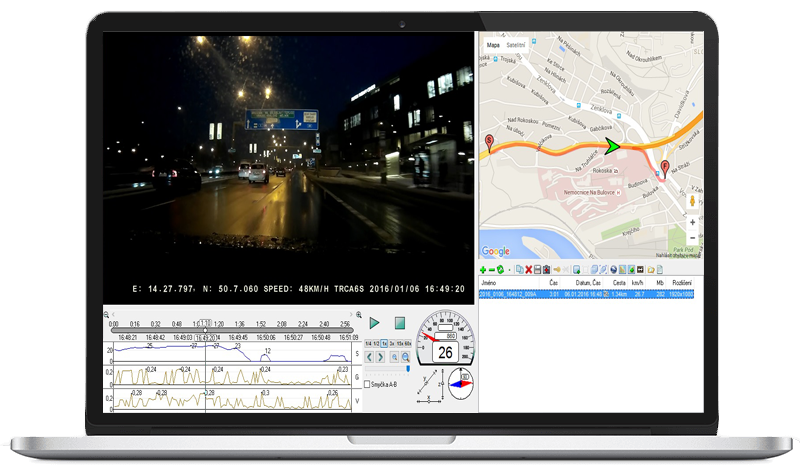 On a single screen it allows you to view your footage, the route on Google Maps, the speed chart and the g-forces obtained from the camera’s internal G-sensor. The TrueCam A7s is a high-end camera for professionals and serious connoisseurs. TrueCam® brand is a registered trademark and our products are protected by patent. All rights reserved.